As it is the year end, businesses need to analyse their progress as well as other elements of practice as they move forward. 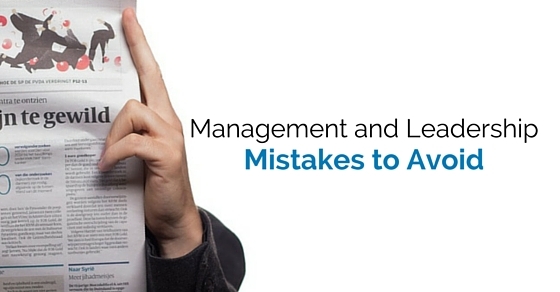 Being in the hot seat of managing people is not an easy task. It requires more managerial skills and patience. But at times, it does get out of control and you realize what would have gone wrong. Managers are designations that carries lot of responsibilities for which many skills are acquired during course of working with different set of people and training. But in spite of them, often it is observed that mistakes do happen. Manager needs to understand that employees working in the organisation must have goals and that too quantified. Employees working without goals is like working without directions or a purpose. Each employee working within the company framework, should be directed through their assigned goal which is in line with the company’s goal. As it is obvious that all work cannot be done alone. The tasks needs to be delegated according to different members as per their experience. Assignments needs to be analysed by manager to assess which task to be delegated. The right team member is assigned the task giving them the responsibility. If the tasks are not assigned to the right or appropriate personnel then failure is inevitable. Managers are sure to attend many meetings with top most levels with regard to business requirements. These latest developments are to be communicated to their peers or their sub-ordinates through proper communication channels. It could be in the form of emails, memos, newsletters, notice boards. Information needs to be transferred quickly to get the job done effectively and efficiently. Recognition is always what employees look forward to. It’s the fruit of their hard work that they have been working for. Besides when the work accomplished gets recognised then it is sure to bring in success. There are many ways that managers could recognize employees. It could be in the form of gathering, party at the end of the day, certificate, awards, etc. When the manager takes time to recognize the employee, it motivates and improves the employee’s morale. The result is improved performance. In a working environment, there are problems that arise and needs to be fixed. If the manager looks to fix by using a quick solution then it is sure to create havoc later on. Managers need to focus on looking at the problem from all sides and allow ideas to flow so that the best solution is opted for. If this technique is utilized then it is sure to curb and curtail many unwanted issues. Every business has opportunity to witness the changes. If manager accepts those changes and adopts them into the business, it helps to push forward the growth of the business. Look at it the other way, if the manager resist the changes that is required for the business, then definitely slowing down of business can be foreseen. Changes are inevitable and is all around the market. To make yourself and the business mould to the changes is the need of the hour. Sometimes manager working in that field for couple of years become complacent, feeling they know everything and do not take effort to learn or adjust. This attitude would eventually force all ideas to be thrown out insisting on doing things their way. They do not analyse other methods or ways to perform the work. Managers needs to have attitude of showing flexibility, tendency to adjustments, open to suggestions. The changes in business world is too fast and to keep abreast of the changes managers must know how to adopt them with open mind. Successful leadership is not got overnight. Through proper analysis and understanding of the obstacles, lessons are learned. Hence watch out for the alerts given to avoid falling into traps. People leading a team need to evaluate the tasks and activities that are being done regularly to find out if they are required or outdated. Once this is done the task can be reformulated with fresh look or can be re-routed to get it done faster and without errors. This will help business to know about the effectiveness and efficiency of the task. To get if flowing within the members of the team, leaders could quantify the goals. Thereby with concrete data it is easier for managers to declare success and reward appropriately. If hiring practices do not involve ample time with relevant qualified staff, and process is speeded up just to fill up vacancy, then wrong people who are underqualified would be hired wasting time, resources and effort. To have an overall improvement or better performance in business, managers need to get involved with right qualified members employing the traditional practices to get an overall picture of the employee, his or her past behaviour. The pre-employment screening helps an organisation to make the right selection. By investing time and money on the hiring process is sure to give the business their returns in the future. It’s imperative that leaders review all the hiring process and on board process thoroughly and ensure of its effectiveness. All companies set up their vision and mission in paper or is displayed on the noticeboards of the company. But does all working in the company are aware of its meaning and how it links with their work every day? If the answer is ‘No’, then it means that the message is not clearly translated to the employees. The leaders need to take time to train and teach how the goal of the company is linked with their goals. Besides, leaders are responsible to translate company’s vision and mission to each employee’s objectives through quantifiable terms. Some companies restate them yearly after appraisals or alter as the goals of the company keep changing. By setting goals repeatedly, employees would then learn and understand what the company stands for. If employees of the organisations are not updated with the latest trend then it is waste of resource. Instead of just getting the latest technology and equipment, leaders need to know that employees are their assets who require training. Training provides spread of knowledge which also motivates them to get the work done better. By providing training, the employees feel they are being recognised for their work and thereby succeed bringing credit to organisation. This can be done only when leaders communicate effectively and on regular basis with their team. Developing team’s skill is required for progress of the company. By not taking feedback into consideration no business will learn their shortcomings and make improvement. There are various means of encouraging feedbacks. Feedback forms, Social networking sites, mobile applications, emails, etc. are some of the ways. A suitable method can be utilised to collect the feedback data and use that for future improvement projects. By considering those feedback seriously, you could make dramatic changes in your processes that could make changes and also improve business. Without evaluating employees on regular basis businesses will lose talented and skilled manpower. Through evaluation of employees on regular basis through performance reviews, conversations during course of the day or meetings with them, leaders would review their performance and get constructive feedback. Make it a point to start communication with employees from the beginning so that their expectations and their performances are monitored. Appraising yourself is required to know where you stand in terms of your goals that you had set. By conducting this exercise regularly it helps you to know if you have met your goals. Also you would get to know your weak point so that you could arrange for training. Besides that you would also come to know if the training undergone has really helped to climb the professional ladder. Making yourself self-aware is very much required to take stock of yourself and for personal growth. Businesses grow rapidly with proper marketing strategies. There are various medium for identifying new markets. PR, marketing research, advertisements, referrals, seminars, conferences, exhibitions, workshops are some of the disciplines that help to strategically identify new markets. Leadership are to be aware of their strengths and weakness. From their mistakes, leaders get better equipped so that they avoid obstacles and create better future.